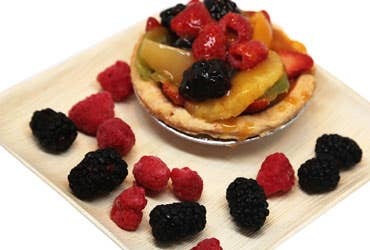 At Restaurantware, we always strive to give you the eco-friendliest tableware available. Although every product we offer reduces your carbon footprint, no tableware quite replaces the sturdiness and durability of our Indo palm leaf plates and bowls. We offer many different types of palm leaf products including various plates, cubik bowls, square bowls, deep plates, rectangular plates, and round bowls. 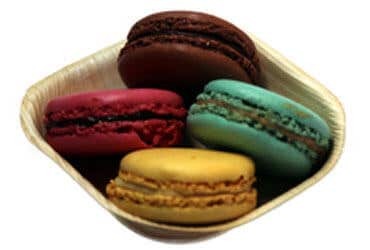 Each have a unique and chic design so they hold any of your food creations. Produced without killing trees: Our palm leaf plates and bowls are made from fallen palm leaves after they are collected from the ground. Thus, unlike many other wood tableware, no trees are harmed in the process of making our palm leaf collection. Since leaves fall all the time, our palm leaf plates and bowls are made from a reliable and sustainable resource. This reduces our impact on the environment because our palm leaf plates take the place of many tableware made from live trees or non-renewable resources. We save trees, and our planet all while using stylish tableware. 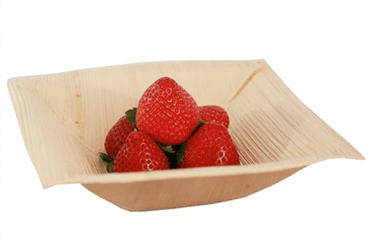 Biodegradable and compostable: Our palm leaf plates and bowls are 100% organic and made out of all-natural palm leaves. 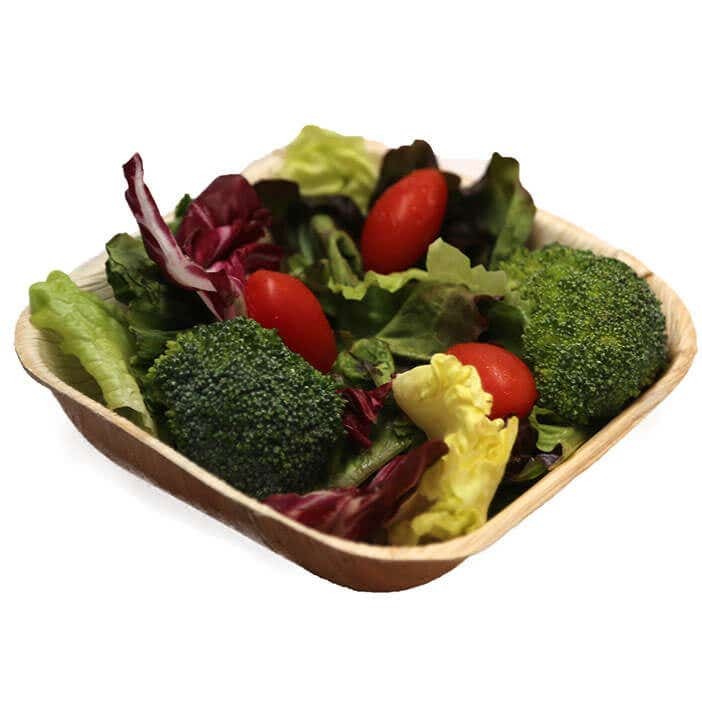 This tableware is biodegradable and compostable, so you reduce your waste by disposing our palm leaf tableware correctly. Over time, our palm leaf plates will decompose on their own, unlike many plastics or other materials. This reduces our piled-up waste in landfills, which also decreases the pollutants we release into their air. Beautiful without chemicals: Palm leaf plates and bowls are very beautiful, even without any added chemicals. With many other woods, various chemicals have to be added to create a beautiful and smooth surface. However, due to the naturally attractive palm leaf, these products are minimally processed to be aesthetically-pleasing. This ensures that no hazardous materials go into your tableware, and also reduces our pollution levels. Showcases foods with ease: Our palm leaf plates and bowls are not only beautiful, but they are also strong enough to hold any food. The material is very resilient, so this tableware will not flimsily bend or tear. Each of our palm leaf plates are carefully made with premium materials, so they are consistently reliable. Our different styles are also very adaptable depending on the food you want to display. Versatile across many venues: The chic, yet classy, look of our palm leaf bowls and plates ensure they are perfect for a variety of settings. Your customers will surely be impressed whether you are serving this tableware in a five-star hotel, modern steakhouse, elegant ballroom, or a casual food truck. These palm leaf plates and bowls can be dressed up or down, and customers of all ages will surely remember this charming tableware. Durable with hot and cold: Our palm leaf collection is strong enough to withstand either hot or cold foods. The durable material is built to last, and will not soften in either warm or cold temperatures. You won't have to worry about the strength of these plates when you serve your culinary masterpieces to your customers. So, whether you are looking for a fashionable way to serve ice cream or a hot steak, our palm leaf plates and bowls are the perfect choice for you. Sturdy when holding many foods: Palm leaf plates and bowls are one of our strongest collections. Thus, no matter what dish you want to display on our palm leaf tableware, these plates and bowls won't wilt under pressure. Our bowls also are durable enough to withstand knife marks, so you can serve heavy-duty silverware with these plates and bowls without a worry. Adds character to any table: Palm leaf tableware is unique and modern, so these plates and bowls will surely stand out to all customers. The rustic look will add personality to all tablescapes, while also functioning well as strong disposable tableware. Your customers will know your efforts in going green once they see your choice in palm leaf bowls and plates. The innovative style and design will spark conversations at the tables, and have customers compliment you on your tableware daily. No flavor transfer from palm leafs to food: One concern many have when using all-natural tableware is a bad taste being transferred from the bowl or plate to their food. The premium materials ensure that this does not happen with palm leaf tableware. Your food's delicious taste and aromas will not be affected by serving them on our eco-friendly palm leaf tableware. Affordable for bulk disposable tableware: Our palm leaf tableware is one of the most affordable on the market. We make sure to bring you high-quality green tableware for a great price, so you can purchase premium tableware but also keep your budget intact. You can purchase this beautiful tableware in bulk quantities, so you will never have to go without having these plates and bowls. Produced without killing trees: Our palm leaf plates and bowls are made from fallen palm leaves after they are collected from the ground. Thus, unlike many other wood tableware, no trees are harmed in the process of making our palm leaf collection. Since leaves fall all the time, our palm leaf plates and bowls are made from a reliable and sustainable resource. This reduces our impact on the environment because our palm leaf plates take the place of many tableware made from live trees or non-renewable resources. We save trees, and our planet all while using stylish tableware. 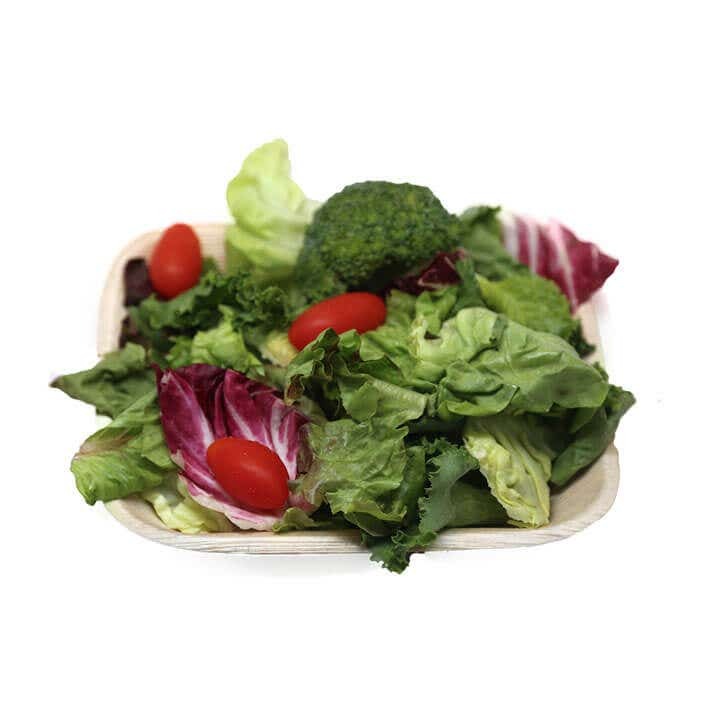 Biodegradable and compostable: Our palm leaf plates and bowls are 100% organic and made out of all-natural palm leaves. This tableware is biodegradable and compostable, so you reduce your waste by disposing our palm leaf tableware correctly. Over time, our palm leaf plates will decompose on their own, unlike many plastics or other materials. This reduces our piled-up waste in landfills, which also decreases the pollutants we release into their air. 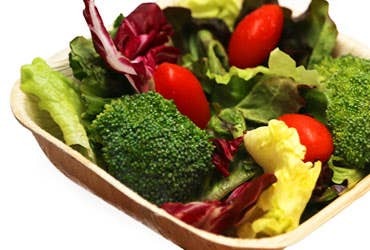 Beautiful without chemicals: Palm leaf plates and bowls are very beautiful, even without any added chemicals. With many other woods, various chemicals have to be added to create a beautiful and smooth surface. However, due to the naturally attractive palm leaf, these products are minimally processed to be aesthetically-pleasing. This ensures that no hazardous materials go into your tableware, and also reduces our pollution levels. Showcases foods with ease: Our palm leaf plates and bowls are not only beautiful, but they are also strong enough to hold any food. The material is very resilient, so this tableware will not flimsily bend or tear. Each of our palm leaf plates are carefully made with premium materials, so they are consistently reliable. 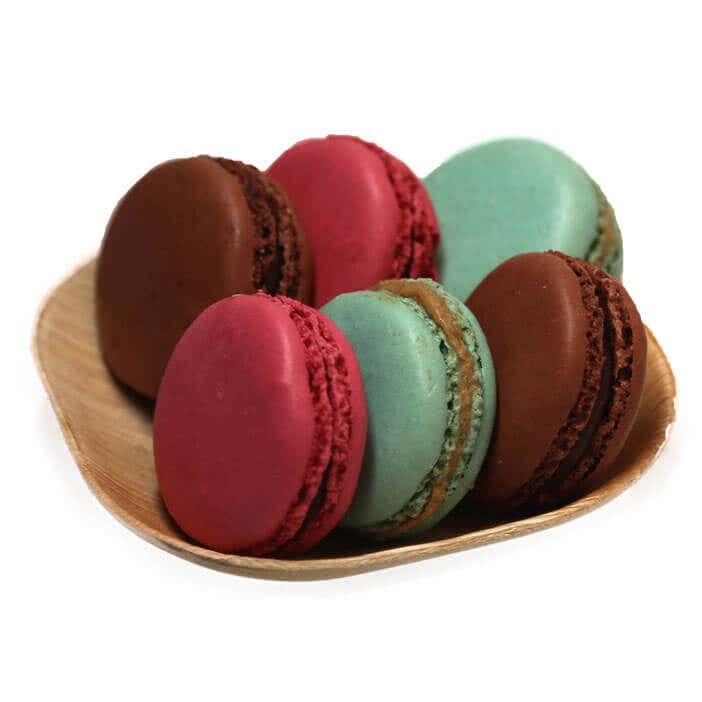 Our different styles are also very adaptable depending on the food you want to display. Versatile across many venues: The chic, yet classy, look of our palm leaf bowls and plates ensure they are perfect for a variety of settings. Your customers will surely be impressed whether you are serving this tableware in a five-star hotel, modern steakhouse, elegant ballroom, or a casual food truck. These palm leaf plates and bowls can be dressed up or down, and customers of all ages will surely remember this charming tableware. Durable with hot and cold: Our palm leaf collection is strong enough to withstand either hot or cold foods. The durable material is built to last, and will not soften in either warm or cold temperatures. You won't have to worry about the strength of these plates when you serve your culinary masterpieces to your customers. So, whether you are looking for a fashionable way to serve ice cream or a hot steak, our palm leaf plates and bowls are the perfect choice for you.